Adventure #21: Ice Lake – Hi, Alpine. 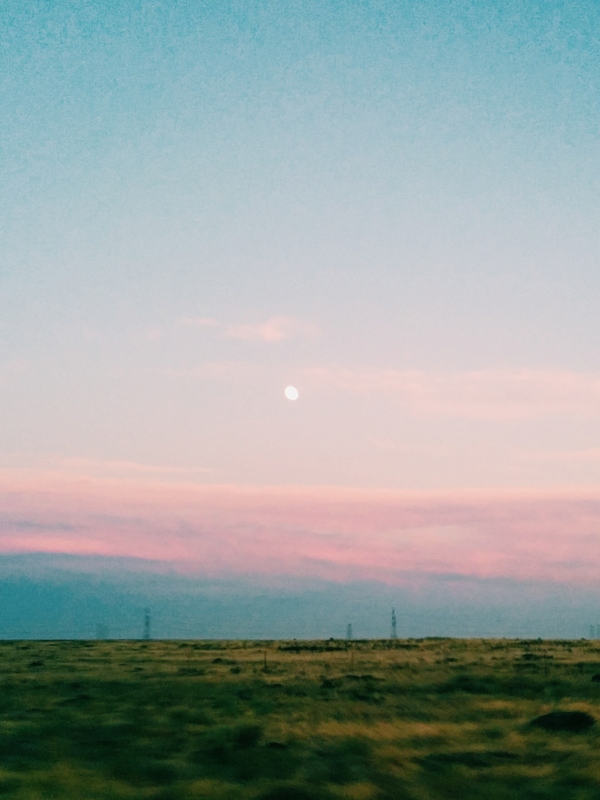 The sky was dusty mauve fading into washed-out denim and hung over us like a giant overturned bowl. A full moon sat above, the only thing obscuring the expanse of view save for the giant wind turbine blades turning lazy cartwheels in the twilight. 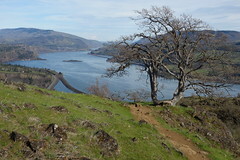 Robin and I had long since left the lush green walls of the western Columbia Gorge behind us and were speeding across I-84 along the Gorge’s other half, this one shades of earth, dried grass, and exposed rock. Hellbent on finishing our early-season triangulation of the NW’s farthest corners, we had set our sights on the Wallowa Mountains and were bound for two nights at Ice Lake. Driving through the dry wasteland with the Cascades far behind us, it was hard to believe that alpine environments waited for us on the other side of the perfectly flat terrain we were hurtling across. At around 8pm we pulled into Pendleton to refuel. The gas station attendant eyed our packs in the backseat and asked us where we were from. “Oh, Portland. I went there once,” and he trailed off as he squinted into the distance. He proceeded to explain how he was wearing four guns during his visit, one on each leg and each shoulder, and then shot a man in the kneecap when told that his kind weren’t welcome in Downtown Portland. He was early 20s at the oldest and I suspected a fair amount of embellishment in this story, but then I noticed the large knife scar on his face and momentarily doubted my doubt. Happy to be un-shot, we finished our drive in the dark only catching shadowy glimpses of the scenery that had ceased to be desert without us realizing. An inky river snaked along to our right well-lit by the moon, and I sleepily thought about how we’d be following this river up and up to the Matterhorn and would watch as it shrank in size from a river to a creek, down to an afternoon snowmelt trickle, finally to a single droplet of water dripping off a glacier. We reached Wallowa Lake around 12:30am, and set up the tent in record time. I was asleep in moments. Robin unwound from the drive with a beer while he walked around the campground. “I keep expecting to see a bear come tumbling through the berry bushes headed toward the river.” Not a quarter mile later, Robin stopped abruptly in the middle of the trail and my eyes followed where he was pointing. A bear had, in fact, come tumbling through the berry bushes and was shambling towards the water. After digging into the ground for a few moments, the bear stood upright and looked across the river in our direction, its cinnamon face regarding us with one part curiosity and nine parts indifference. My face? One part terror and nine parts awe. This was a first for me. 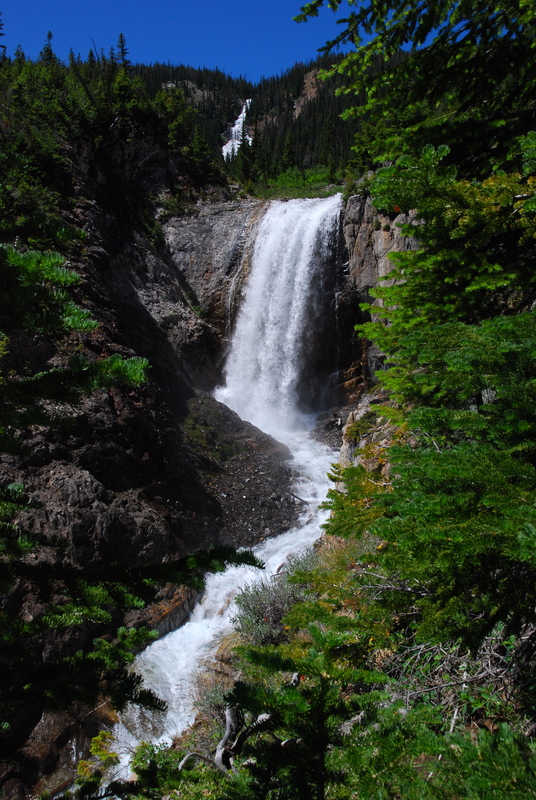 A couple miles further, we spurred off to the right on Ice Lake Trail #1808 and began a purgatorial climb up through stands of conifers, meadows, and slate rock falls studded with quaking aspen. Switchback after switchback made progress up the gentle ascent seem glacial in pace, which was amplified by the stifling heat that had caught up to us. We leapfrogged with two other parties who were shuffling along, heads down with arms hanging limp; we were all feeling the relentless sun. About halfway through the climb, we reached a plateau that looked too perfect to be real. On the far side of the plateau, the mountain resumed its climb with Adam Creek cascading over its top lip, winding through the basin and feeding an emerald green meadow and proliferation of wildflowers before plummeting off the edge into the valley we had just risen above. We stopped for lunch in a stand of pines and listened to the roar of the twin falls, occasionally breaking the serenity with curses aimed at the carpenter ants taking too many liberties with our personal space. The remainder of the trail proceeded with yet more switchbacks before abruptly spitting us out at the top. Before us Ice Lake sat nestled in a bowl flanked by granite peaks. The lake was a Robin’s egg blue, the air smelled strongly of pine, and the air was filled with the sound of snowmelt waterfalls feeding the lake from several directions. It all added up to be a slightly overwhelming first impression, gently marred only by a tremendous number of camps already set up. Undeterred, Robin found a private, quiet corner of the lake where we couldn’t see anyone else. We commented on how strange it was that there were easily 30 people camping in the area and I was the only lady. I dubbed the crowd Mantasia Men’s Retreat 2014: Alpine Splendor and couldn’t help feeling a bit like an interloper. Just after dinner, we were joined in camp by a doe that materialized out of thin air just 10 feet away, which is more startling than it sounds. She slowly picked her way around camp and paid us no real mind, then ambled down to Ice Lake’s shore and off toward the next camps. Robin named her Svetlana, and we would end up seeing her right on schedule each breakfast and dinner the next two days. I, for one, was just happy to have another lady around to break up the regularly scheduled sausage fest. The next day, we set out to circumnavigate the rest of the lake and hike up the Matterhorn, formerly regarded as the tallest peak in the Wallowas but now relegated to taking second place to Sacajawea Peak. The trail wasted no time at all and cut upward at a calf-burning slope. “Trail” may be too generous of a phrase as this was more of an unmaintained climber’s path taking a direct, efficient route out of the lake valley and up the side of the Matterhorn. The increasingly remarkable views distracted from the likewise increasingly sore leg muscles as we watched our lake grow smaller in the distance, and new mountains begin to peek up over our ridge as we approached the summit. 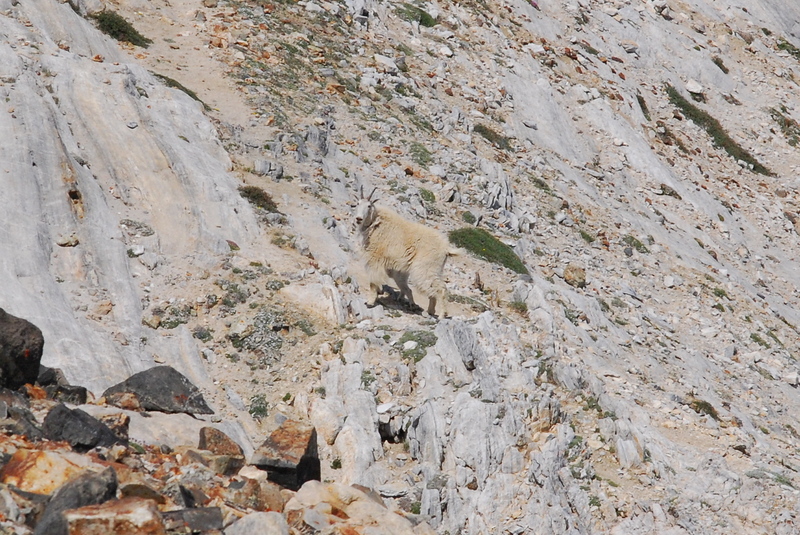 To my sheer delight, we spied a couple of mountain goats on and adjacent ridge which sent me right over the moon. The bear had been one first, and now these goats were another. With the summit in view, the alpine fever took over and I clambered up the last few feet. Elated, relieved, and somewhat exhausted, I stood up straight and looked right into the eyes of another mountain goat, not 15′ feet away. I froze. “GOAT,” I stated. Loud, forced calm. The goat’s baby then stepped out from behind its parent. My brain warred between fawning over the cutest little snowy puffball with black merry eyes that smoked the hours of adorable animal internet videos I’ve viewed, and visions of me getting butted back down the mountain by the less than amused parent goat. “AND BABY GOAT.” Less calm. I became acutely aware of the bovine scent that drenched the summit, the goat droppings everywhere, and chunks of goat fur snagged in the rocks. This was their home, and now I really felt like an interloper. 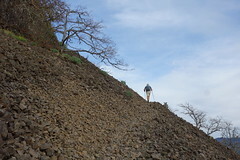 Robin scrambled up behind me and held out his hiking pole as the parent goat did a warning mini-charge forward before cutting diagonally down this particular hump of the mountain and over to an adjacent area. The baby clattered alongside, its too-long legs and knobby knees making it appear to do an enthusiastic tapdance over the limestone. Goat encounter evaded, we found the summit register in the form of a ripped up piece of envelope stowed in a plastic water bottle buried in a large cairn. Going right for the shmoop jugular, I signed the register with Krista + Robin Darkley, 7-12-14. First mountain summit on our first wedding anniversary. Maybe it was the baby goat, maybe it was the lack of oxygen, but I couldn’t help myself. My heart was a melty mess. We basked at the top for about 20 minutes and enjoyed the company of several dozen ladybugs and two more indignant goats that trip-trapped by. Ridge after ridge lay before us and all the panoramic photos in the world couldn’t capture how big it all felt. But, we tried. Valiantly. On the way down, Robin suggested glissading down some of the snow fields to save time and our knees, which is essentially sledding on one’s rump. I had never done this before and was not sure how I felt about careening down snow patches at high velocities. Robin went first and somehow, while watching him fly down the slope, I slipped and fell over at the head of t his track and ended up accidentally glissading after him. Terror instantly gave way to joy and, hopelessly hooked and a total convert, I insisted that we glissade the rest of the way down, which we did, five more times. We made it back to camp in record time. The next morning, we packed out. Two nights was a beautiful introduction to the Wallowas, but not nearly enough time. We’ve resolved to return with more time to get further into the interior of the park and further away from some of the area’s crowds. Returning to Wallowa Lake was reminiscent of days spent deep in the Columbia Gorge seeing only one or two other people, then returning to the zoo that is Multnomah Falls. Wallowa Lake is surrounded by alpine chalets, more miniature golf courses than seems necessary (and this is coming from a big fan of miniature golf), boat rentals, bumper cars, and arcades, all visually clambering over each other to attract tourist attention. No shortage of parks and access points to the lake are provided with a plethora of paved roads and parking lots leading right to the edge. 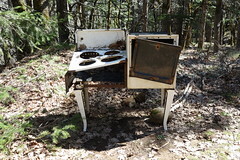 It is a distinctly different way to experience the outdoors than what Robin and myself seek out, and always seems slightly jarring to return to. Despite this, we can’t wait to return. …as far as the eye can see. Waterfalls feeding the lake from all corners. Robin appraises the spoils of his hiking victory. Our lake looked so tiny from the top.